British and Irish Lions XV: L Williams (Wales); A Watson (England), J Davies (Wales), B Te'o (England), E Daly (England); O Farrell (England), C Murray (Ireland); M Vunipola (England), J George (England), T Furlong (Ireland); AW Jones (Wales), G Kruis (England); P O'Mahony (captain, Ireland), S O'Brien (Ireland), T Faletau (Wales). Replacements: K Owens (Wales), J McGrath (Ireland), K Sinckler (England), M Itoje (England), S Warburton (Wales), R Webb (Wales), J Sexton (Ireland), L Halfpenny (Wales). New Zealand XV: B Smith; I Dagg, R Crotty, SB Williams, R Ioane; B Barrett, A Smith; J Moody, C Taylor, O Franks, B Retallick, S Whitelock, J Kaino, S Cane, K Read (captain). Replacements: N Harris, W Crockett, C Faumuina, S Barrett, A Savea, TJ Perenara, A Cruden/L Sopoaga, A Lienert-Brown. New Zealand snuffed out the British and Irish Lions' hopes of a shock win with a ruthless display at Eden Park to take what looks like an iron grip on the three-Test series. Great game that was much closer than the score suggests. The brilliant efficiency of New Zealand proved the difference, converting pressure into points. The Lions had their opportunities, but ultimately left points out on the field. A problem that has plagued the touring side all tour. British and Irish Lions XV: L Williams, A Watson, J Davies, O Farrell, E Daly, J Sexton, C Murray; M Vunipola, J George, T Furlong, M Itoje, AW Jones, S Warburton (captain), S O'Brien, T Faletau. 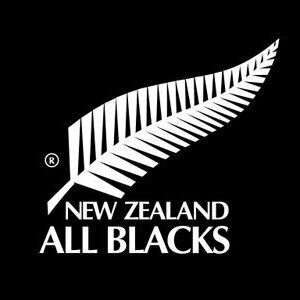 New Zealand XV: I Dagg; W Naholo, A Lienert-Brown, SB Williams, R Ioane; B Barrett, A Smith; J Moody, C Taylor, O Franks, B Retallick, S Whitelock, J Kaino, S Cane, K Read (captain). Replacements: N Harris, W Crockett, C Faumuina, S Barrett, A Savea, TJ Perenara, A Cruden, N Laumape. The Lions pulled off one of their great wins to steal a thriller against New Zealand and set up a series decider in Auckland in a week's time. When Sonny Bill Williams was red-carded for a shoulder charge on Anthony Watson - the first All Blacks sending off in 50 years - the Lions sensed a wonderful opportunity for a historic upset in Wellington. Epic test match, even better than the first. Great result for the Lions, great result for rugby. The Sonny Bill Williams red card was 100% the correct call. Fair play to the All Blacks who gave an outstanding account of themselves playing a man down for close to 50 minutes. The Lions discipline hurt them for large periods of the match. They kept the New Zealanders in the game by giving away penalties within kicking range, & even conceded their numerical advantage for 10 minutes via the Vunipola yellow card. To the the Lions credit they delivered in the crucial moments of the test match both in attack & defence, to ultimately square the ledger 1-1. 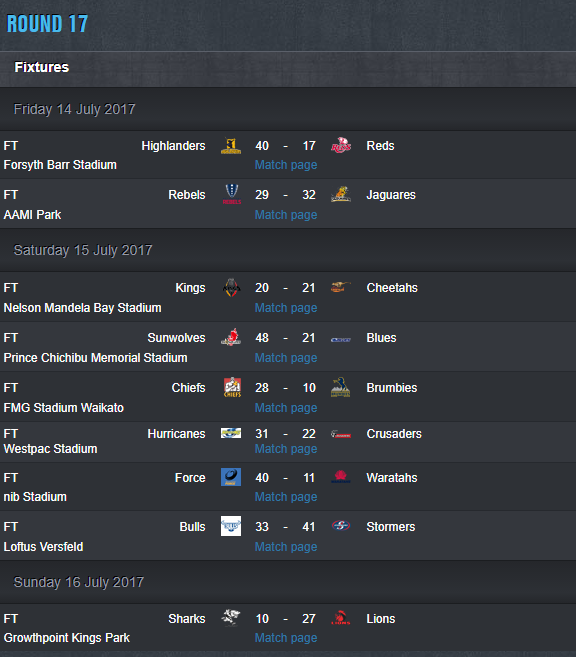 The series now goes to a decider in Auckland where both teams have everything to play for. New Zealand XV: Jordie Barrett; Israel Dagg, Anton Lienert-Brown, Ngani Laumape, Julian Savea; Beauden Barrett, Aaron Smith; Joe Moody, Codie Taylor, Owen Franks, Brodie Retallick, Sam Whitelock, Jerome Kaino, Sam Cane, Kieran Read (captain). Replacements: Nathan Harris, Wyatt Crockett, Charlie Faumuina, Scott Barrett, Ardie Savea, TJ Perenara, Aaron Cruden, Malakai Fekitoa. A long-range penalty three minutes from time from Owen Farrell snatched a draw for the Lions in an epic third Test and with it a share of the series. Unbelievably, we end up with a drawn series. The All Blacks controlled large portions of the match, & were particularly dominant in the early stages. Plenty of scoring opportunities were created, but few converted into points. It was the Lions, however, that finished the stronger. The tourists will no doubt be ruing missed opportunities of their own, that potentially could have broken the deadlock. Although the game was played with great intensity, both sides basic skills & discipline let them down in crucial moments, & neither team could break away & claim outright victory. Ultimately, the drawn result is a fair reflection of both the 3rd test, & the overall series. Both teams competed fiercely, provided fans with some truly breathtaking rugby, & are thoroughly deserving of equal standing upon the podium, & placing within the history books. Hopefully, this tour result puts to bed any talk of the Lions being an outdated concept in the professional era. Quite simply it was a tour for the ages, imo. 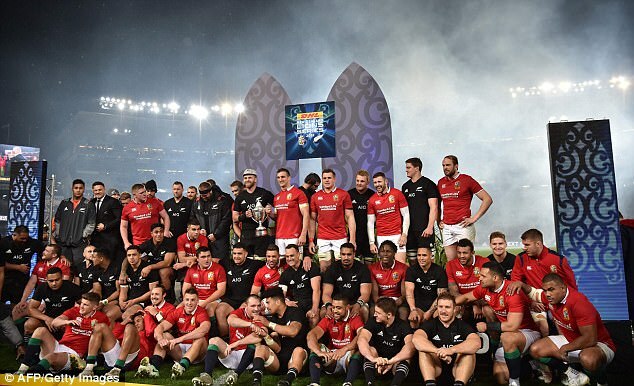 Would be historic if the Lions could beat the All Blacks for the first time at Eden Park in over 20 years! Don't see it personally though, the Kiwis always pull it out. Very good game. Great intensity. Your predicted scoreline felt like a truer representation of the game. It was close, even if the score reflects a 15-point gap. It was really a case of the All Blacks capitalising on every opportunity, & the Lions failing to make the most of theirs. The SOB try from the Williams break was brilliant rugby. 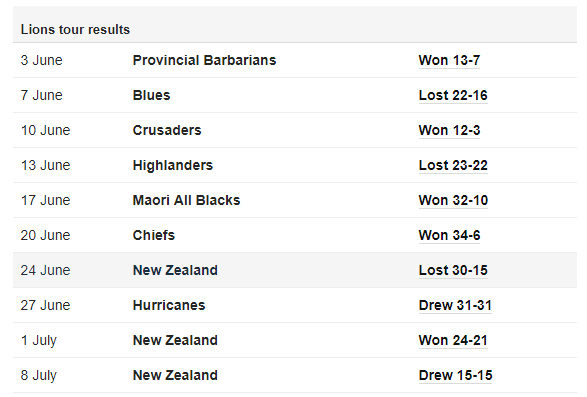 It'd be a great result for rugby, if the Lions can win in Wellington & send the series to a decider back in Auckland. 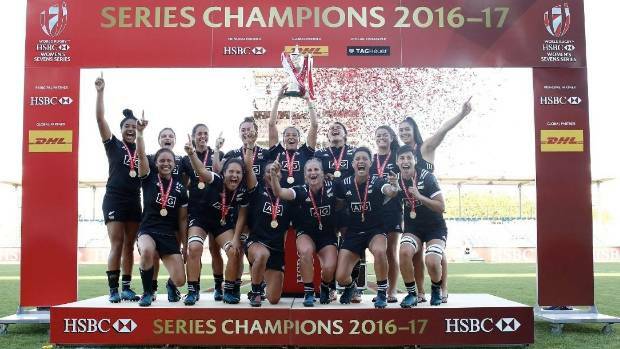 New Zealand are the World Rugby Women's Sevens Series champions after taking out the final tournament in France. The team secured the world title after beating hosts France in the semifinal 21-7, before rounding out their series win with an emphatic 22-7 win over Australia in the tournament final in Clermont-Ferrand. Well done, NZ. Deserving champions. NZ are so damn good and clinical. Today the boys have a chance but not sure about Wyn Jones and dropping Teo'o, but let's see. Well Gatland just proved me wrong. Still can't believe he left Itoje out of the first test. Still not that convincing against 14 men for 3/4 of the game. Agreed. I was concerned about some of the selections, but tbf it seems to have worked. Did the red card have an effect? Probably, but that backline looked fluid when they moved the football. In the end, the Lions got the (W). Terrific result. ... Game 3 Decider - incoming. Discipline is still a bit of a concern, but the attack has really found its feet. Remembering the Toby Faletau try was scored while it was 14 v 14. Farrell was deadly with the boot. And that defence ... One word - BRUTAL. There was a period in the 2nd half where the Lions were putting in one big hit after another, just knocking All Blacks back at a rate of knots. The physicality & collisions during this Lions series are reminiscent of late-2000s / early-2010s Steelers v Ravens, or the early / mid 2010s Seahawks v 49ers games... The type you feel in your lounge room. 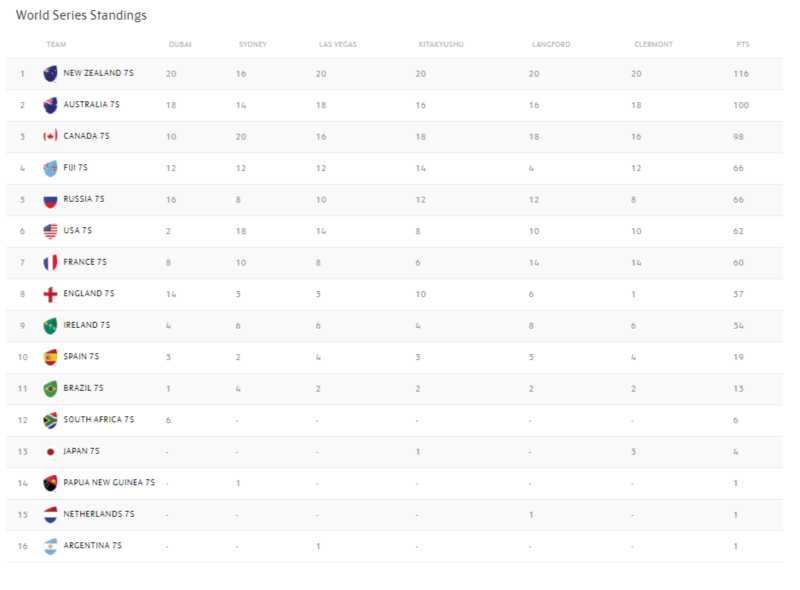 All to play for next Saturday, can't wait. Fitting result, & fair reflection, imo. 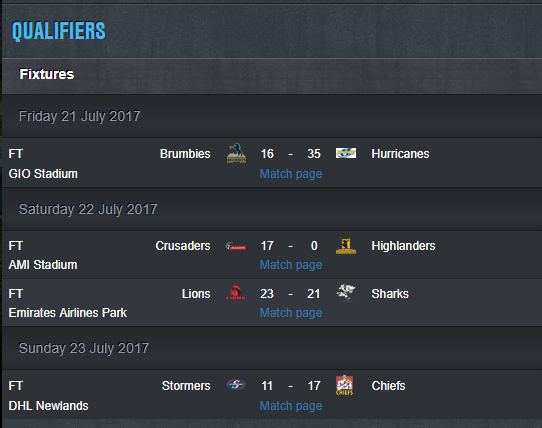 There was a lot of fantastic rugby played over the past month. Pleasure to watch. Sadly it has to come to an end. 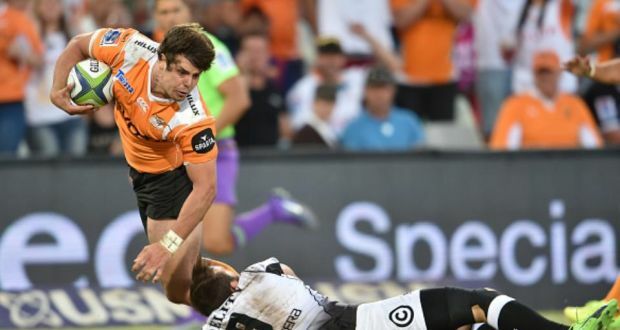 THE South African rugby union confirmed on Friday what was already widely expected as it axed the Cheetahs and Southern Kings from Super Rugby from next season. SA Rugby said the two teams have reached agreements with the national union on their Super Rugby exits and will explore other “international competition opportunities,” the biggest hint yet that they will join the Pro 12 competition in Europe. Super Rugby organiser SANZAAR resolved this year to cut the southern hemisphere competition — which features teams from five countries and three continents — by three teams to 15 to help make it more financially viable. An interesting shake-up to the club rugby landscape, perhaps? The Pro12 will be expanded to include South African side Southern Kings and Cheetahs from September, organisers have confirmed. The expanded tournament will be called the Pro14 and see the teams split into two conferences of seven made up of two Welsh, two Irish and one team each from Scotland, Italy and South Africa. 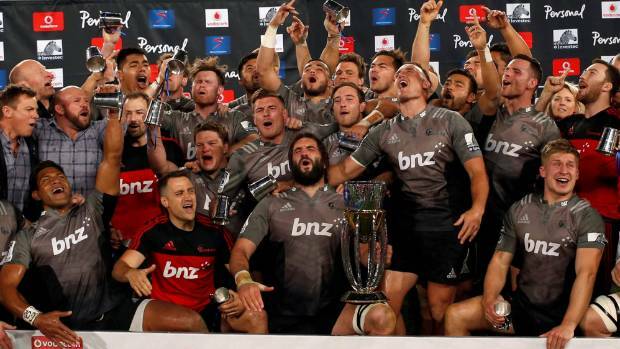 The Crusaders have been welcomed home by hundreds of fans at Christchurch Airport late at night after beating the Lions 25-17 to become Super Rugby champions. The team arrived home on Monday night holding their prized possession, the Super Rugby championship trophy, with Captain Sam Whitelock first to be greeted with cheers. Congratulations to the Crusaders on their 8th Super Rugby Title victory. Best team all year, well deserved.